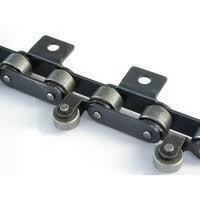 We are a leading manufacturer and exporter of Slat Conveyor Chains. Fabricated from finest quality raw material, they find diverse application in various industries. - Chain conveyors utilize a powered continuous chain arrangement, carrying a series of single pendants. The chain arrangement is driven by a motor, and the material suspended on the pendants are conveyed. A Chain Conveyors is a type of conveyor system for moving material through production lines. Chain conveyors utilize a powered continuous chain arrangement, carrying a series of single pendants. The chain arrangement is driven by a motor, and the material suspended on the pendants are conveyed. - Basically used for handling sugar, cement, rice, and wheat bags. 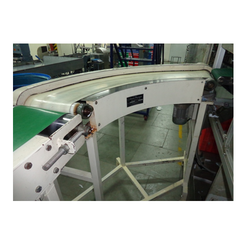 Type: Horizontal, Inclined & z type conveyor etc. Conveyor Type: Horizontal, Inclined & z type conveyor etc. Chain Size: As per conveyor capacity. Backed by competent personnel, we manufacture and offer a comprehensive range of conveyor systems that encompasses roller conveyor, Chain Conveyor, Screw Conveyor, Belt Conveyors. Our range of conveyor systems is widely appreciated for their trouble free operation and efficiency. All these machines features simple structure, low power consumption and low investment cost. As per the requirements of the customers, we are involved in offering best quality of Chain Conveyor System. The offered Chain Conveyor System is extensively used according to the various needs of different industries. Further, the offered products are appreciated for their hassle free performance.